Hello my name is Cynthia and I am a fiber addict. It's true; to me the lure of nubby yarns, silken embroidery flosses, crisp fabric bolts, and rainbow felts are completely irresistible. Wool, cotton, silk, they all seem to have a magical pull on me; enticing me to run my fingers down the length of a piece of fabric, to rub a strand of yarn against my cheek...I can't resist the siren call of a fabric or yarn shop...it's just beyond me. And don't even get me started on all the wonderful fibers and fabrics to be found online. I try to be good and to limit myself to things I know I'll use but sometimes it's SO hard. Here's a bowl of my current yarn passions, two are wool/ silk sock yarns and the other two are alpaca (the brown)and angora (the white) for knitting bunnies. The wonderful blue gray sock yarn is hand dyed and from the marvelous Phiala. See what I mean about online supplies? I've been knitting since I was a child but never as well as I could crochet. I've done scarves, mittens, hats, and the occasional stuffed animal but never the biggie...socks! Recently however, I've found myself in the strange position of teaching several of my friends how to knit. Since this is something they all want to do eventually (shoot, one of them has outpaced me already!) I decided it was time to take the plunge and finally learn to knit socks. It's been a slow process but I eventually found a great pattern and since then I've been making good head way. I love how organic it looks so far, like a creature found in a coral reef. I'll be coming up on heel turning soon...wish me luck! 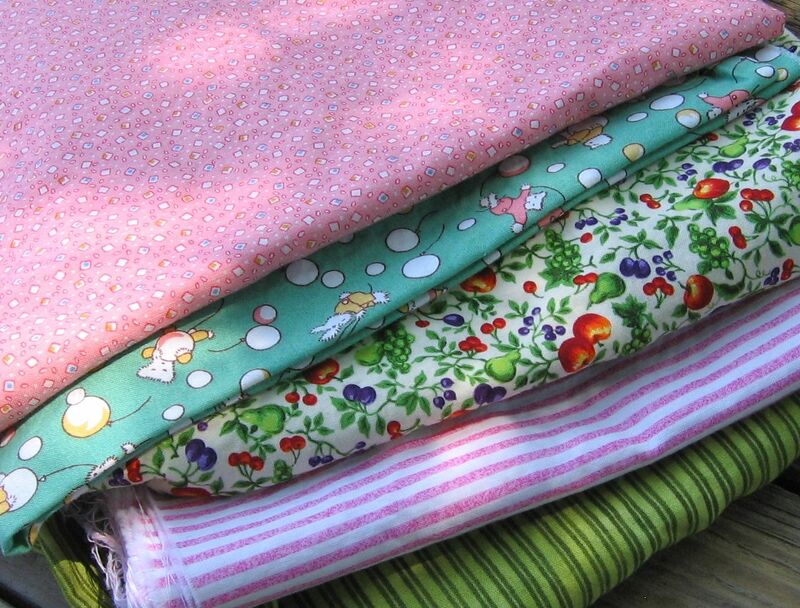 In addition I recently made a trip to the mountains and of course had to stop by School House Fabrics...that place is so amazing...and added these to my stash. 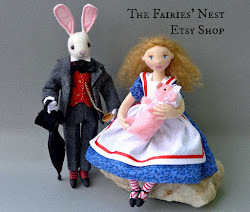 Won't that bunny print be sweet on one of my felt bunnies? That and the pink print both have a wonderful retro feel. 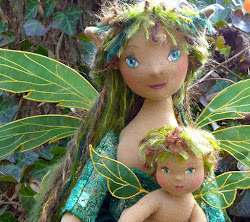 Lastly, and since you've made it this far, I'll leave you with a sneak peek at the fairy I'm making to donate to The Night Garden. We had a vehement argument on the length of her hair, I wanted short, she wanted long...you can see who won. Well LOOK AT YOU!!! :D Get on with your talented self. One craft I have never been able to grasp is knitting. Will there be new socks for this coming fall/winter? Hope so. 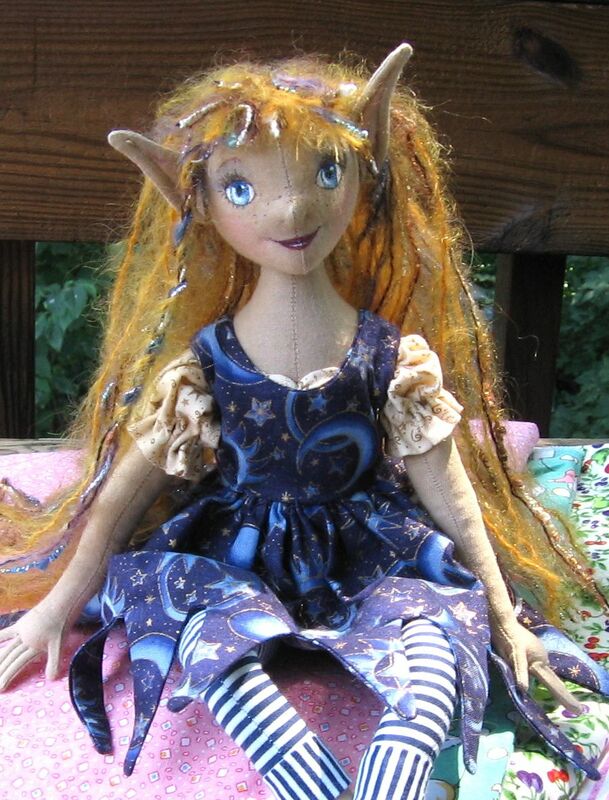 Lovely fabrics you bought and another wonderfull fairy you made!! Your doll is adorable. I am a fiber addict as well. Headed to Ireland next week and believe me, I'll be looking for some cool fibers there! Looks great! Wish I could come join your knitting class! You and I share the same addiction, and mine branches into the sparkle of beads. Do you think we should start a 12 step program or just go with it. I'm a craftaholic...addicted to fibre, material, pompoms, and glitter glue!! Your dolls are just gorgeous!!! SO happy I came here!! I'm still practicing crochet. I like it but i just need to work on it more. Urg.I cant go into a Joannas without dropping some dime. I love the remnants bin. I don't use lost of fabric in what i do so i love a bargain. A friend from work just gave me two trash bags full of yarn. I honesty have no idea what to do with it all but i have to figure something out! WOW!! I Love this beautiful wool. 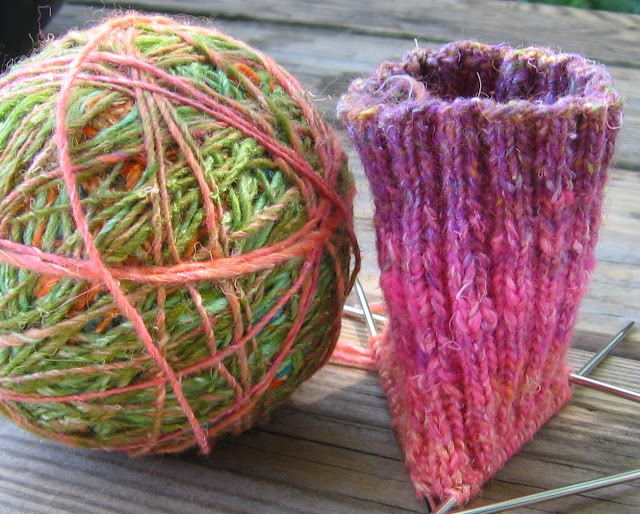 I have a desire to knit too - but alas I can only manage either purl or plain and nothing more adventurous than a scarf. These pictures are so pretty, they almost look like candy! 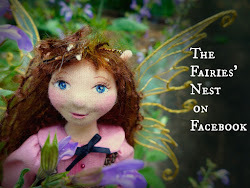 I keep a set of three of your little lavender dolls by my front door, because they are so sweet and eye catching! LOVE those fabrics! You go girl - SOCKS ROCKS! Oh my goodness, soo happy I found this site! Your creations are both astonishing and beautiful. Wonderful job!